Did you get skunked by the Leonids meteor shower last month? Me, too. The run up to the peak was disappointing with only a handful of meteors seen in the early evening up to the day before the peak. The peak occurred on Shabbat when we don't go out, so we don't know what it was like, but the denouement the following days was also sparse with meteors. You get to try again with the Geminids meteor shower which peaks this year during Chanukah on the night of December 13 and December 14. The actual peak itself is forecast to fall at 8:30AM, Israel Standard Time, on the morning of December 14, in other words in daylight. But the previous night of the 13th and the night of the 14th itself should still be very good, especially since this year there is no bright moon in the sky to interfere with the shower. 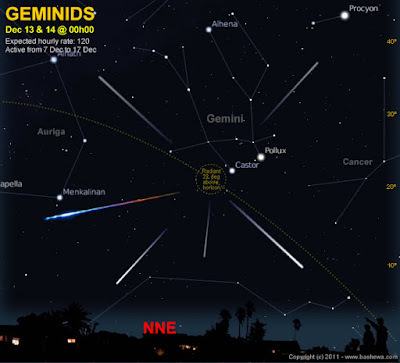 The Geminids is one of the most reliable showers of the year with the peak showing up to 120 meteors per hour. It is also a good shower for children since the radiant of the shower, the point in the sky from which the meteors appear to emanate, is already high overhead early on winter evenings, starting around 9:00 to 10:00PM. The radiant is in the constellation Gemini from which the shower, like all meteor showers, takes its name. It is already high up early in the evening. All meteor showers show best after midnight, since then the earth is turning in the direction of its orbit around the sun, increasing the entry velocity of the meteoroid particles into the earth's atmosphere. But it isn't necessary to wait until after midnight to see lots of meteors if the shower performs as expected. 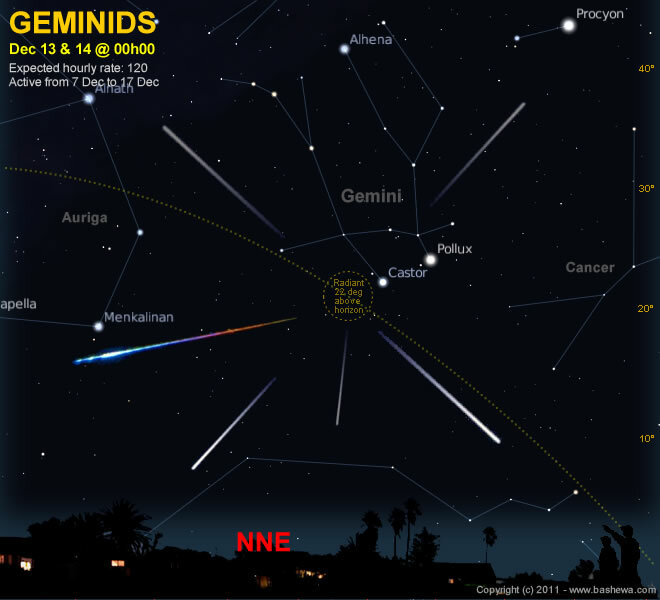 The radiant of the Geminids meteor shower lies in the constellation Gemini. It lies near the bright star Castor in Gemini. It isn't necessary to look at teh radiant when observing but since meteors come from all sides of it, one generally sees more meteors when lookin in the direction of the radiant. For the Geminids look northeast before midnight. After that, follow the constellation as it crosses the sky in the early hours of the evening. Meteors are bright streaks of light made by tiny particles of dust and rock from comets or asteroids. As these particles fall to earth they burn up from the heat of friction in the earth's atmosphere. 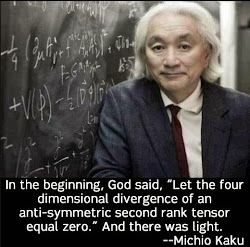 Most of these particles are the size of a grain of sand, so obviously we are seeing the brilliant light they make as they incinerate themselves in the earth's dense atmosphere, not the particle itself. So meteors are very much local phenomena, becoming visible some 75-150 miles in the air above us. Although meteors can be seen every night throughout the year, a meteor shower occurs when the earth passes through the path of an ancient comet or asteroid as it orbits the sun. Then all of the debris of the comet or asteroid falls to earth at roughly the same time, creating showers of particles in our atmosphere. 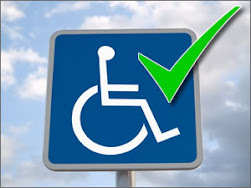 Meteor showers are whole sky phenomena and not only is optical aid unnecessary it is detrimental to viewing the shower. Your unaided vision gives you the widest field of view of the sky. A meteor shower occurs when the earth crosses the path of an ancient comet or asteroid and the debris from the object rains down on the earth simultaneously. The Geminids meteor shower originates not from a comet but from 3200 Phaethon, an asteroid discovered in 1983 that circles the sun every 3.3 years. In fact, recent observations suggest that Phaethon might be a "rock comet" that sheds particles when its surface heats up roughly to 1,300 degrees F (700 degrees C) at each perihelion. 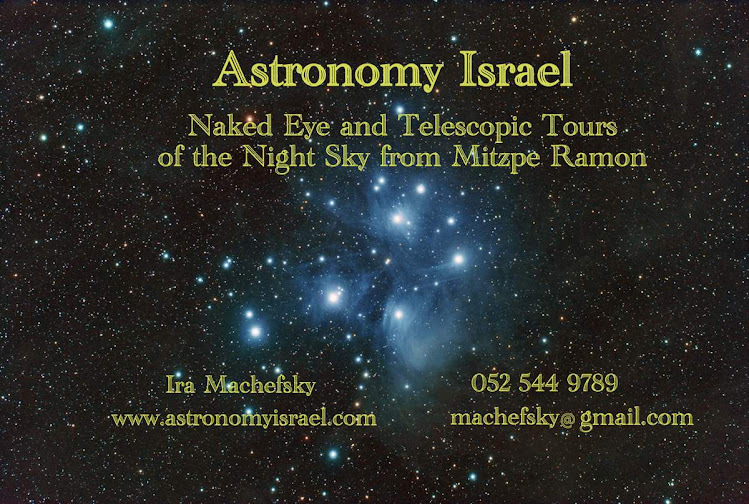 We will have star tours every night of Chanukah, including of course the peak shower nights of December 13 and 14. Come on out and enjoy the show. I looked out after 1 AM in Modiin and didn’t see anything. The sky was light and seemed to be pretty cloud covered. Maybe that’s why I didn’t see the shower. Yes, unfortunately most of the country was cloud covered. But there’s also a huge amount of light pollution in the center of the country. You will only see the very bright members of the shower from there. You usually need to be out for at least an hour to see significant activity.